Should I replace my current DVD collection with high-definition Blu-ray discs? Recent surveys have revealed consumers are not so displeased with the quality of their DVDs. But I have seen what Blu-ray disc quality looks like, and the possibility has got me crunching some numbers. The current Blu-ray Disc library on Amazon.com consists of approximately 1,038 products. That includes box-sets, TV shows, bulk-packs and any other unique Blu-ray products. Looking at recent Amazon prices, the average cost of a Blu-ray Disc seems to have gone down from an average of $29.95 to $24.95. Although if you walk into any Best Buy or Walmart you will still see regularly priced Blu-rays at $30 and $35. What I did was modestly figure what it would cost me to replace my entire standard DVD collection with Blu-ray Discs. I gave Blu-ray the benefit of a doubt, placing the average price of a BD disc at $25. I figured I could get some for less than that, but then also having to replace some box sets which run upwards of $60, I thought this was reasonable. My collection is not so large compared to many friends who have libraries of 500+ that take up entire walls of their living rooms and bedrooms. And while they collect movies of all types, my 200+ collection focuses only on a couple genres, those being action and science fiction, with a few dramas mixed in here and there. Now, some math. $25 per disc multiplied by 200 titles comes out to a solid $5000 to replace my collection. Add a BD player at $399 and an HDMI cable and you are close to $5500. Spread out over several years that number doesn’t seem so bad. Heck it must have taken me over 10 years to acquire all the DVDs I have. 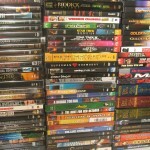 If I purchased all my standard DVDs at an average of $14.99 that would be $3000 over 10 years – about $300 a year. For the average consumer, that seems pretty reasonable. But the $5000 figure really does put a wrench in the works. Are there any alternatives to switching to Blu-ray Disc for the price of a used car? One alternative would be to wait a bit for the prices to come down. By the next holiday season you would expect Blu-ray Discs to drop at least $5. And, high-definition players and HDTVs should drop as well. Another alternative would be to buy all the must-have Blu-ray Discs you can afford, while watching your standard-def DVDs upscaled on a BD player. If you sit far enough back you won’t even notice the difference.